UCL’s Ramsay Hall (£8391.60 for a single room for 40 weeks). Earlier this year UCLU published statistics that revealed the true extent of the cost of living in UCL halls in proportion to student incomes. But how much have rent levels and student incomes changed over the past few years? A quick historical comparison reveals exactly how much rents and student incomes have changed since before the tuition fee increase was declared in 2010. 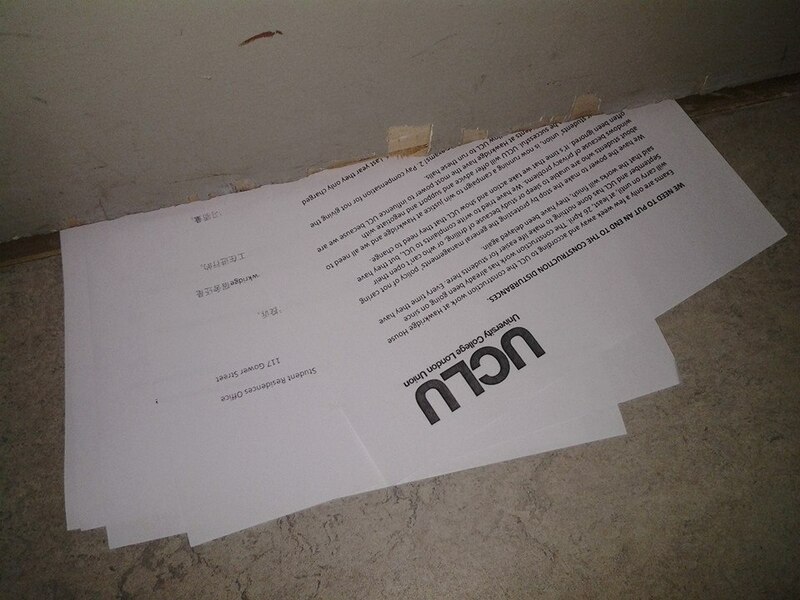 All rents cited are based on statistics from UCL. The average rates for 2009 do not include halls that are no longer in operation in 2015. The dataset does also not include rates for halls recently acquired through the UCL-Institute of Education merger. The cost of living statistics cited are based on the UCLU research and have been updated to include rents from 2015-16. In 2009, undergraduate rooms were let for 37 weeks whereas in 2015 contracts last 40 weeks. Average cost increase calculations are based on the full academic year as there is no option for a shorter contract. 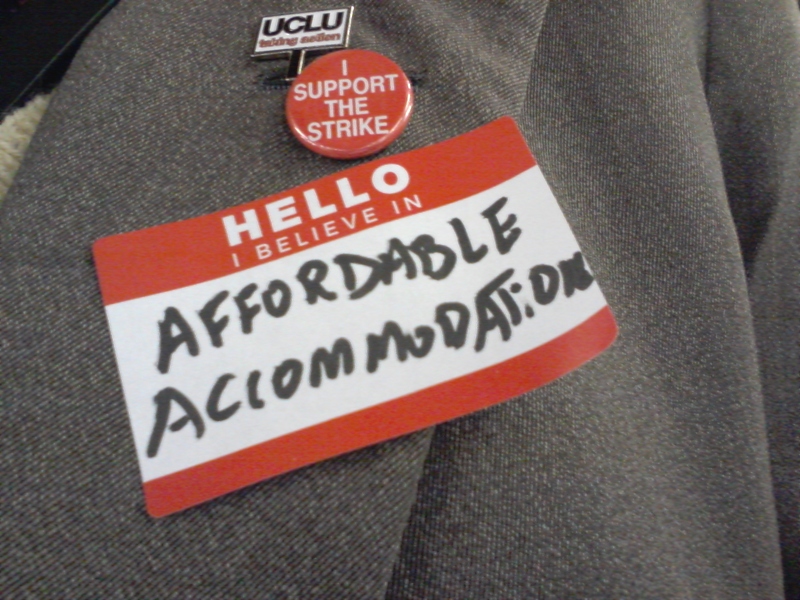 Since 2009, the average cost for a single room at UCL has increased by almost 55%, or £2484.94 for the academic year. This means that the average room, which six years ago cost £4546.68 (£123 per week), now costs £7031.62 (£176pw). This is very slightly above the cost of a median-priced room, which stands at £6983.20 (£174.58pw) – a 56% increase from 2009. 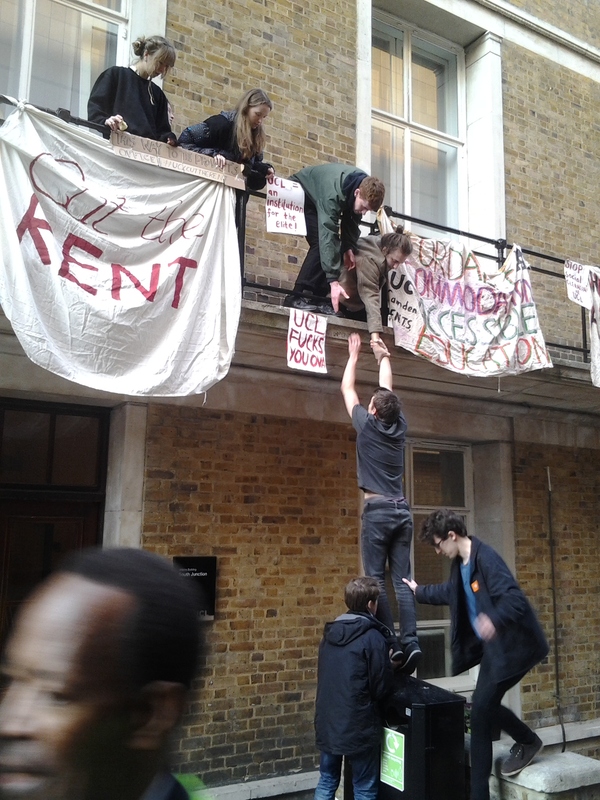 The most dramatic increase, proportionately and in real terms, has been in Astor College, where rent has gone up by 96% from £106.19pw to £192.50pw – £7700 spread across an academic year. Although this includes added costs for catered dinners it means that Astor College is now one of the most expensive halls at UCL. Most commonly, rooms which cost around £120pw in 2009, now cost £174.58, or £6983.20 for 40 weeks. Rent in the most expensive halls has increased less proportionately, but matches the average increase in real terms. 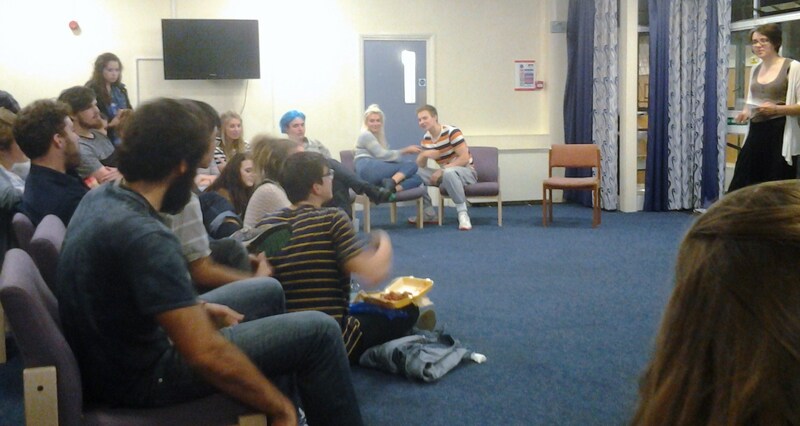 Frances Gardner House, for instance, has risen from £5677 (£153pw) to £8103 (£203pw), or 43%, for the academic year. The two least expensive halls have risen slightly less in real terms (by £1945, to £5432.60), but match the average percentage increase. Additionally, since 2009 UCL has discontinued its very cheapest and genuinely affordable rooms. These rooms have been replaced by several rooms offered in halls that fall within the most expensive range of UCL accommodation. 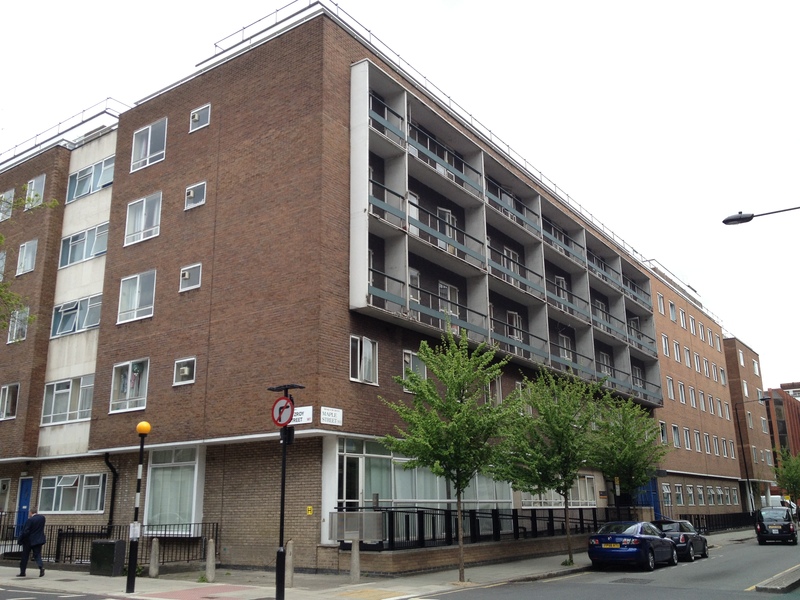 In 2009 it was possible to rent a room at Clifford Pugh House in NW3 for £88.62pw. Rooms at UCL-run Holmbury St Mary in Dorking could be rented for half this price. In 2015 these rooms are no longer on offer and have been replaced by rooms at Woodland House in N7 and St Pancras Way in NW1 for a rent of £197.98 and £213.15pw respectively. The most expensive rooms at UCL can now be found at Prankerd House, where the rent for a single room is £8710.80 (£218pw) for an academic year, almost as much as tuition fees. The increase in student incomes from maintenance loans and grants during this period has been between 12 and 16% depending on students’ means-tested funding. In real terms, a student in London who in 2009 would have received £6928 for an academic year now receives £7788, in loans and grants – a real-terms increase of £860 for a year. 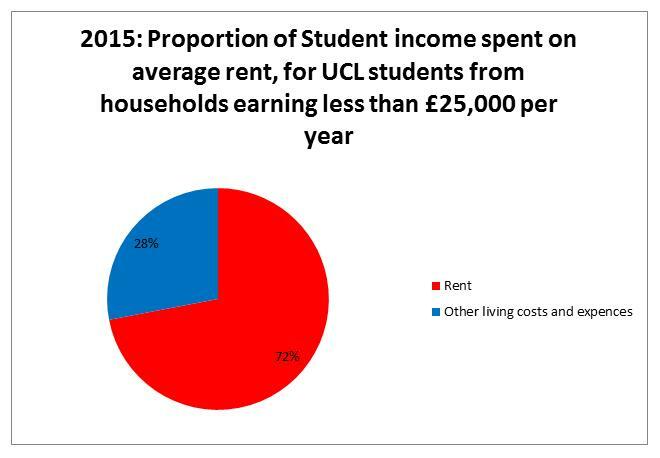 As a result, the proportion of students’ income taken up by the average and the median rent at UCL has risen from about 53% to 72% for students from households earning less than £25,000 per year – an increase of 35%. For those from households earning more than £45,000 per year this change has been from 65% to 90% of their student income. This does not include further costs of living such as food and clothes. At UCL the student bursary has been frozen for the past few years at £2000 and £1000 per year for students middle and low income households respectively. In comparison, the increasing cost of commodities according to the Consumer Prices Index has since been 19.8 percent. In other words, Student rents have increased at a rate more than double that of inflation while grants and loans are now worth less compared to average commodities. 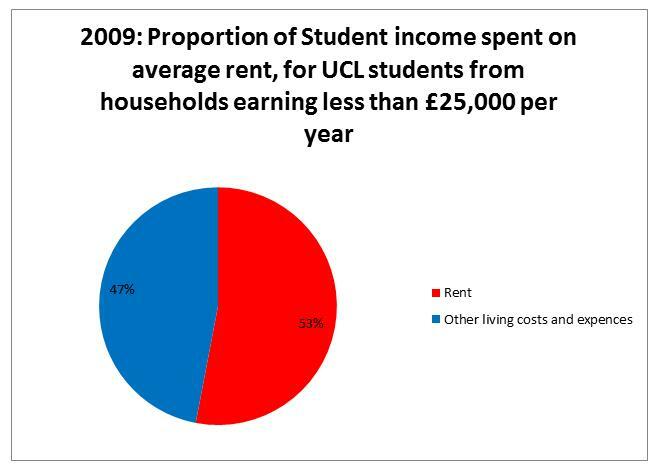 Comparing the cost of living at UCL to grants and loans reveals that a considerable amount of rooms are unaffordable in the sense that no student could afford to rent them were they to live off their current rates of student income. This including the UCL bursary, specially intended to cover living costs. An overwhelming majority of rooms leave students from households earning more than £30,000 per year on a weekly budget of less than £30 once rent and other essential costs have been paid (not including travel costs). 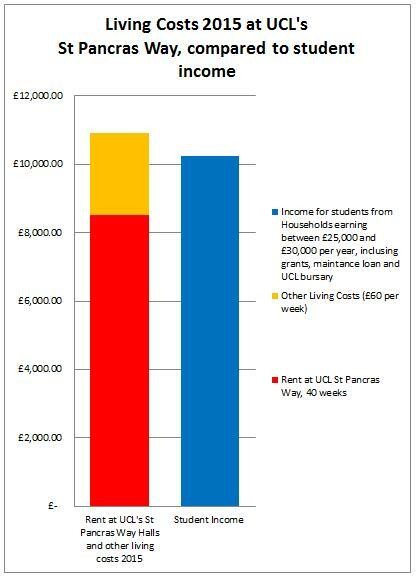 At St Pancras Way a student from a household earning between £25,000 and £30,000 now has to pay more of the cost of rent and other essential living costs than their combined income from grants, loans and the UCL bursary. The same goes for four other UCL halls. For students from households earning between £40,000 and £45,000 per year, 19 out of 22 halls are unaffordable in the sense that their student income will not be able to cover rent and basic living costs. For students from households earning between £35,000 and £40,000 the corresponding number is 14 out of 22. The median income for a household with one child and two adults is £36,600. The median income for a household with two children and two adults is £44,200. Compared to the local median rent in the London Boroughs of Camden and Islington, where a large number of UCL rooms are located, UCL rents are considerably higher than market rates. Median market rate rents in these boroughs are £152 and £143pw respectively, which places UCL’s median rent of £174 in the top quartile. From the perspective of what is considered ‘affordable rents’ (80 percent of market rates), only UCL’s very cheapest rooms qualify as ‘affordable’ compared to the median rent in the WC1 postcode area, and all rooms fail to qualify if compared to the median rent of Camden Borough. All UCL rents fail to qualify as ‘living rents’ (defined as not exceeding 35 percent of tenants’ income). 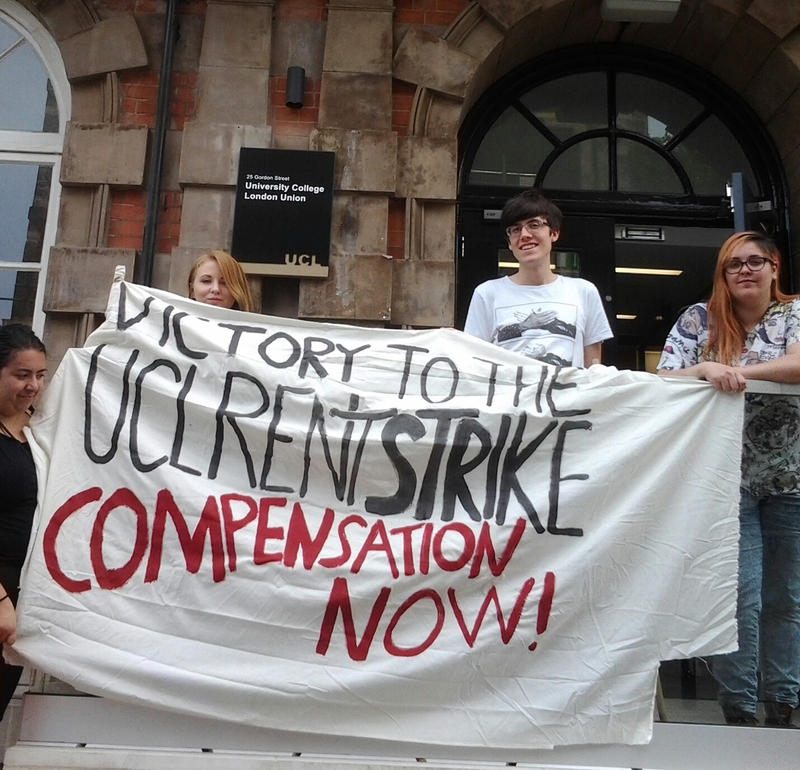 Between 2009 and 2015 the surplus made by UCL from students rent, in other words the difference between the income received from accommodation and the running costs, increased from £5,300,000 to £12,285,000. 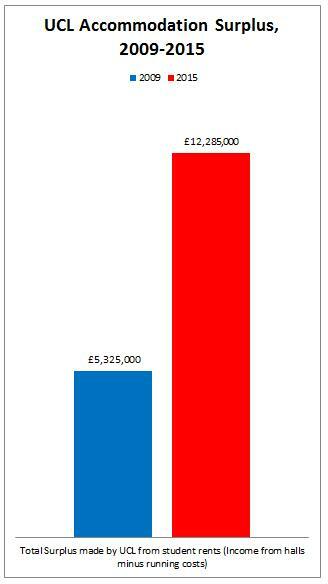 It is also worth noting that this figure continues to climb sharply, as the surplus will run at £15,779,000 for the 2015/16 academic year. This represents an increase of almost 200%. 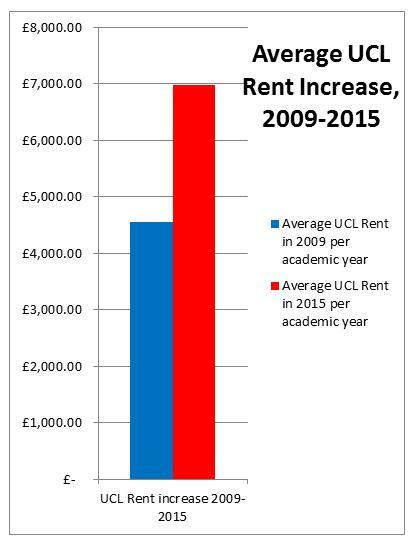 Over the course of the past 6 years rents at UCL have increased at a rate that outpaces corresponding increases in student income both proportionately and in real terms. Furthermore, as a result, students across the board, now pay a greater proportion of their income directly towards rent than ever before. 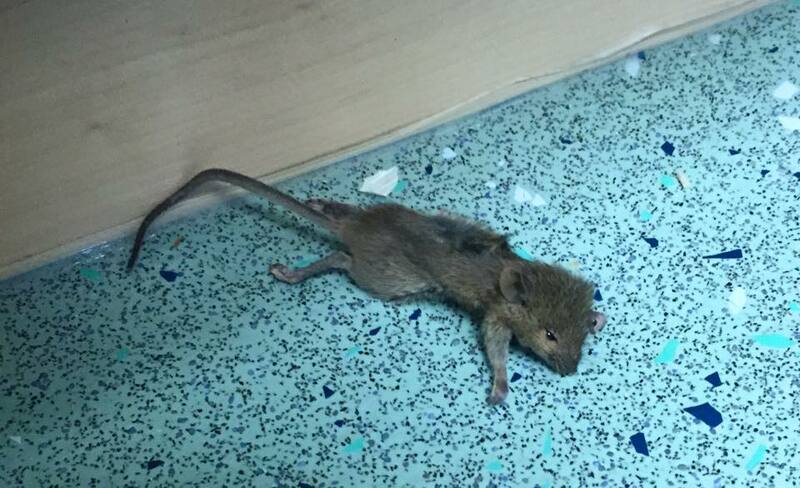 Once other basic living expenses have been considered only a small minority of rooms at UCL allow most students to spend more than £30 per week towards other costs while a substantial proportion of rooms do not leave students with any money left of their income whatsoever. 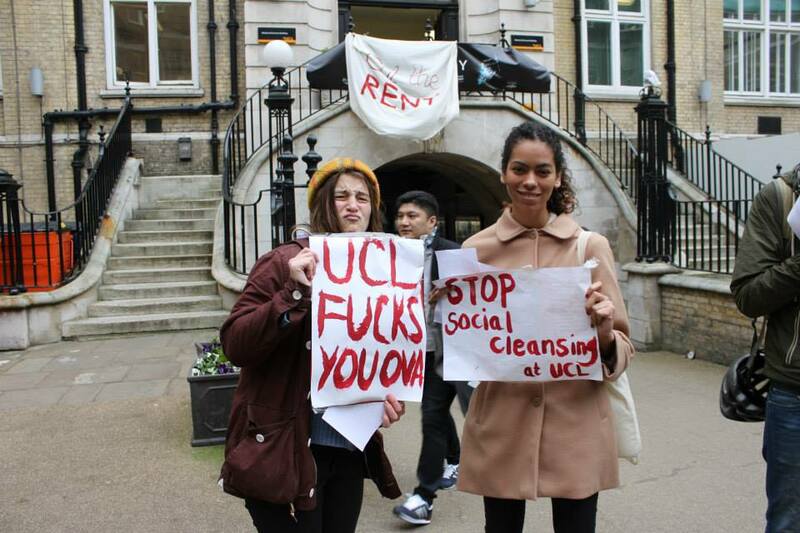 UCL has also removed its most affordable rooms and acquired new rooms at the most expensive end of the scale while at the same time the College makes greater surplus off student housing than ever before.